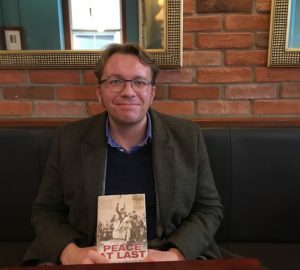 A Liverpool university professor has published a new book which paints a vivid portrait of Armistice Day. 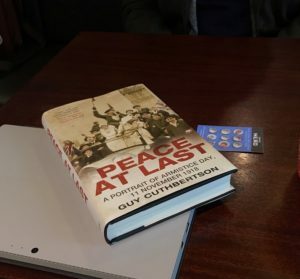 Author Guy Cuthbertson’s book, ‘Peace at Last’, is the first to focus solely on events that occurred after the guns fell silent on November 11th, 1918. This Sunday will mark 100 years since the end of World War One. Mr Cuthbertson, who is an associate professor in English Literature at Liverpool Hope University, told JMU Journalism: “It is quite unusual to find a non-fiction book covering a singular day. At the time, the end of the First World War was thought as the greatest day in history. According to Cuthbertson, even with rumours circulating, people were surprised by news that the war had ended. Many had become cynics due to abandoned promises, so there was an element of spontaneous joy. Armistice Day witnessed mass celebrations, with chaos and carnival across the nation. The commemoration for lost loved ones came the following day, with many sombre church services. In the book Peace at Last, readers can find numerous ways that the end of the First World War was celebrated. There are accounts of cross-dressing, children dressed as army officers marching in the streets, and even violence across the nation. The book includes descriptions of revelry in Liverpool and other local areas. In Wallasey, people danced around a burning effigy of the Kaiser. In addition, the port brought the arrival of American soldiers, who marched through the city firing their guns to news of victory for the Allies. On Sunday, Liverpool’s Lord Mayor Cllr Christine Banks, will lead the city’s main Remembrance Sunday service at St George’s Hall Plateau to mark the centenary of the end of the First World War, with other events across the region. Liverpool Echo: Where is your nearest Remembrance Day service?